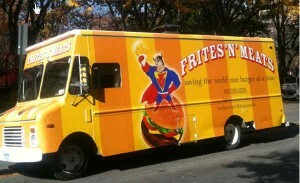 Frites ‘N’ Meats – New York City, NY (@fritesnmeats) – Food Truck Talk – Searching for the best foodtrucks! It’s an overcast, cool, rainy day today…. perfect for some comfort food. That makes it perfect for a great burger and incredible fries. 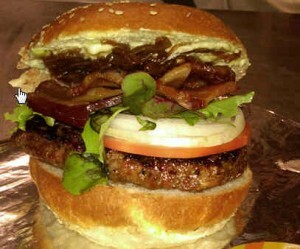 New York’s Frites “n” Meats delivers in both areas. First off they start their burgers with a choice of two quality types of meat. Either grass fed angus, or wagyu american kobe. Combine that with quality bread products like a brioche, potato-onion or sesame seed bun and you are starting off just fine! With base quality ingredients like this most would expect to pay $15 for a burger, at Frites “N” Meats the grass fed angus burger is $5.50 and just $2.00 more for the american kobe. When it comes to cheese the choices are also top of the line. Gruyere, goat, brie, cheddar and blue cheese are all available. Class up your burger with additional toppings like onion, tomato, mesclun greens, onion jam, guacamole, bacon and oven roasted tomato. Generally the Frites ‘N’ Meats burgers are cooked medium-rare to compensate for the time it takes to get the burger back to your desk or home. The burgers are wrapped in insulated material so your burger will actually continue to cook while it’s transported. But Frites ‘N’ Meats is happy to cook your burger your way. (Hmmm, is there a jingle in there somewhere?). Once you have created your perfect burger, you must have perfect fries or frites. The fries at Frites “N” Meats are belgian-style, this means that the fries go through the Belgium double-frying process that ensures that your fries will have the perfect golden color, fabulous crispness on the outside and wonderful potato creaminess on the inside. Perfection. If you must… ketchup, mayo, mustard, and a variety of aioli’s are available. The Frites ‘N’ Meats menu is supplemented by several tasty soups (also perfect for a cold and gloomy day) and Lena’s homemade dessert treats (pefect for any day).